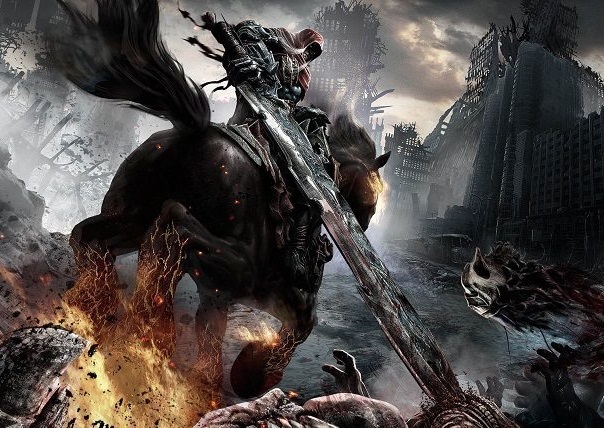 If Darksiders on its original release was intended to be an entirely straight-faced rendition of the biblical apocalypse, I still can’t help but feel like it’s a tongue-in-cheek joke in 2019. The game’s grimdark setting takes a walk on the absurd side – with hulking stone golems, blood fountains, outrageous finisher moves and schlocky dialogue that will surely rouse a chuckle. It’s dated for sure – it was developed by an in-house studio of the old THQ (not the same company as THQ Nordic), if you remember back to those days – but its robust gameplay mechanics have stood the test of time better than you’d expect. Pair that with a story which might have been cool last decade but is its own hilarious parody today, and you’ve got a game which is definitely worth a revisit. Darksiders is an action-adventure game, but that term holds a lot of baggage that needs to be unpacked. Action-adventure today means God of War (the PlayStation 4 one) or The Legend of Zelda: Breath of the Wild, while ten years ago it meant the original God of War and The Legend of Zelda: Twilight Princess. That is to say, ten years ago, open worlds weren’t really a thing. Neither were tight over-the-shoulder perspectives or emergent gameplay design. Darksiders instead exhibits a kind of beautiful inelegance that we don’t see much of today, but was once the hallmark of mid and upper-tier game development. 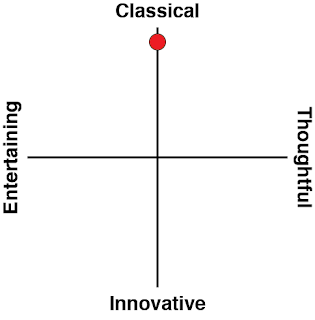 This is a game which co-opts in all of the popular genres of the time. It’s got Zelda style puzzle-dungeons because that was cool. It’s got Devil May Cry style combo-combat, because that was cool too. Heck, it’s got quicktime events, gory cutscenes and even an on-rails Star Fox-like section. Some might say this is messy design, but I found it to be a charming window back in time, to see the way studios thought. And while the game isn’t greater than the sum of its parts, the individual parts themselves are owed their due praise. First and foremost, the combat is robust and interesting. It’s a beat-em-up complete with combos, alternate weapons, dodges and flashy finisher moves, but it’s complemented by the game’s diverse locales and a level design that keeps the player moving. Just in the first two hours alone you’ll plough through desolate city streets, abandoned churches, crumbling highway overpasses and subterranean caves, picking up a variety of offensive options. Since you’re always picking up new gear and upgrading your existing moves, you’ll never find combat to be a chore, and you’ll be itching to see what new tricks the game has in store. 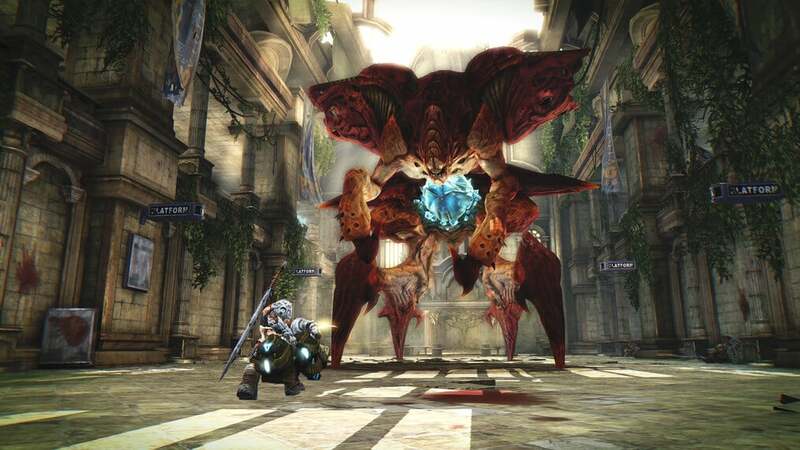 The game particularly shines in the boss battles, which are some of the most challenging and cinematic moments the game has to offer. While they do follow the Zelda pattern of “use the key item you found in this dungeon for massive damage”, they also know to make the player work for their victory, leading to a God of War style catharsis upon every successful kill. It’s here where the game’s other influences lie – pulling inspiration from Shadow of the Colossus as well as Zelda and cinematic action games. The story also does a great job to pique your interest, mixing a healthy level of intrigue and absurdity. The gist is that the biblical Apocalypse is underway and War, one of the four horsemen, has been called down to the earth to participate in the battle between angels and demons. But something is amiss, things aren’t going quite to plan, and there’s justice to be had amidst this great battle for everyone’s souls. I’ll admit there are many plot points which come off as esoteric – the game isn’t afraid of throwing around vague epithets like The Betrayer or The Destroyer, assuming the player will catch onto what’s happening – but if you think of it as framing for some epic battles and cutscenes, the semantics won’t matter. I do particularly like the gruff voice acting which riffs on some very strange lines, and trying to pass goofy dialogue as stone-faced serious. If there’s anything that doesn’t shine quite as brightly as the rest, it’s the puzzle and platforming design. In the game’s various dungeons you’ll find everything from block-puzzles, locked door gauntlets, destructible walls and perilous jumps. These are effective at breaking up the monotony of too much combat, but the puzzles can occasionally veer on the easy side and lapse into tedium due to the sheer size of the levels. 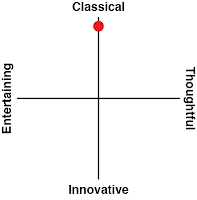 These segments are forgivable, if also forgettable. Darksiders was a visual marvel even in its original release, and the remaster is sure to remind players of the bold design choices made by Vigil Games. The crumbling cityscapes are desolate in an almost poignant way, and the grotesque labyrinths which make up the game’s various dungeons are appropriately unnerving. The enemy designs are fiendishly creative, and although we’ve seen the usual ghouls, bats and zombies a million times before, the large foes and bosses still inspire some shock and awe. Cutscenes are bombastic with camera movement that would make Michael Bay proud. I’m not usually a big fan of violence but I still had to appreciate the complexity of the finisher moves, too. The greatest benefit of the Switch port for me has actually been the HD rumble. The developers have been very careful to use the rumble to its best effect – adding weight to sword swings, shudder to endured attacks and a little extra oomph to the big cutscene moments. This, paired with the excellent sound design, had my heart pulsing even when playing in handheld mode – a feat rarely achieved by other games. 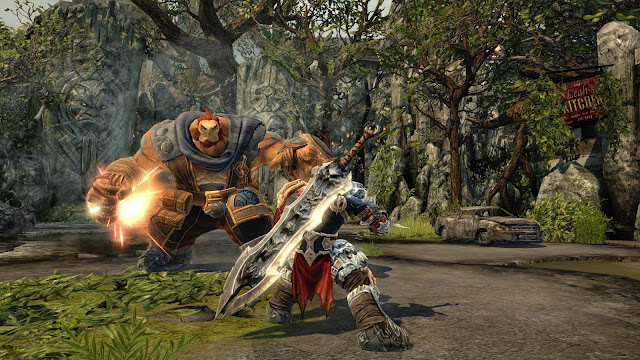 Overall, Darksiders is dated and a little embarrassing, but it’s also surprisingly good. It’s a testament to the robust design choices that Vigil Games made when developing their original title, that each of its parts holds up after a decade of innovation in gaming. If anything, returning to the no-nonsense combat and exploration of 2010 era design made me recognise how much fluff is in the popular titles nowadays. Rather than bog players down with big open maps and emergent gameplay interactions, Darksiders is simple. Either you’re fighting, or you’re exploring, or you’re solving a simple puzzle, or you’re fighting again. It’s a proper achievement that a developer could take something this simple and make it stand the test of time so effortlessly.